outbuildings and under bridges. Straw or horsehair are incorporated into the nest, which is lined with feathers. EGGS: Usually 4-5, white with brown and lilac spots, .8" long. HABITAT: Farmland, marshes, widespread in open country. Open a door or window in suitable outbuildings. Provide artificial nest cups in structures lacking rough surfaces. If an outbuilding is not available, place nest cups outside, under the eaves of a garage or shed. Be sure the nest will be well protected from sun and rain. Provide a mud tray near the nesting site and keep the mud wet during nest building. Offer ground egg shells in a jar lid feeder on a post. During unusually cold wet weather, offer small insects in a feeder placed in the swallows' flight path inside the building. Normally there is absolutely no need to offer supplemental food to swallows or any other species. Avoid using pesticides on your garden and lawn: rely on birds and beneficial insects instead. 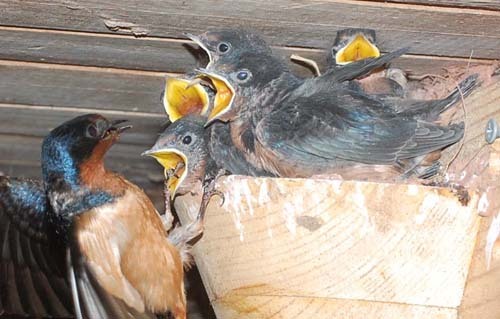 Do not knock down nests after the swallows leave. They will be reused the following year. &COPY; 1992 - 2013, American Artifacts and Richard Van Vleck, Taneytown, Maryland.